However you might run into trouble when configuring Azure SAML integration with your self-hosted Helpdesk installation or sometimes even the hosted installation that uses a "custom domain". AADSTS50011: The reply address 'https://xxxxxxxxx/helpdesk/Saml/Consume' does not match the reply addresses configured for the application. If you're using a custom domain - make sure you use it in the "REPLY URL" setting, not the "*.jitbit.com"
Unfortunately we have no control over our listing in the Azure catalog, it is Microsoft who maintains these settings. 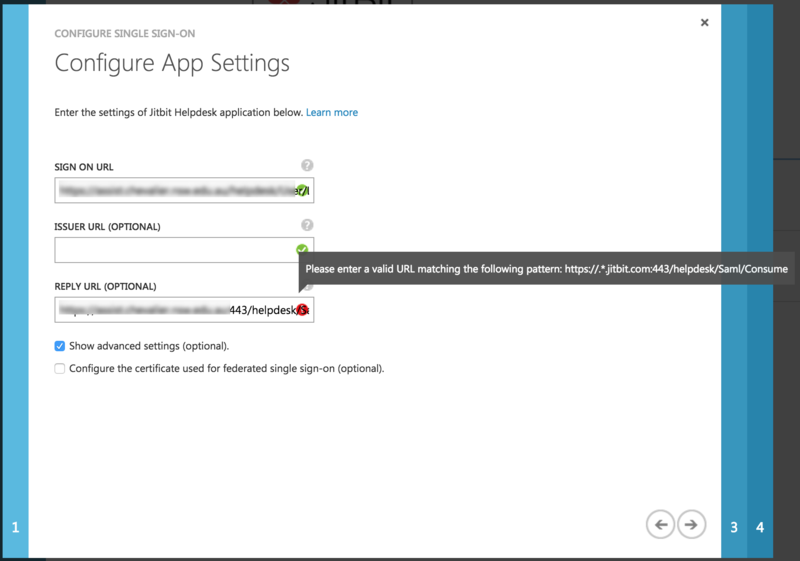 Click "configure single sign on"
Select "SAML single sign on"
NOTE: when creating a custom app make sure you have "https" in your "Reply URL" and that you use HTTPS for your helpdesk app, because Azure does not support "http" connections when working with SAML. And it will throw a very misleading error, something like this "The reply address 'http://my_server:51030/Saml/Consume' does not match the reply addresses configured for the application: 'https://www.jitbit.com/web-helpdesk/'." which has nothing to do with the actual error - that you forgot the HTTPS prefix.